Children all have a favourite type of toy they just can't get enough of. In our house, that toy is ponies. We have it all... playsets, figurines, coloring books, accessories, movies, stickers and best of all, books! Luckily, I think ponies are just as cute as my daughter. They are sweet and great at delivering messages of kindness. 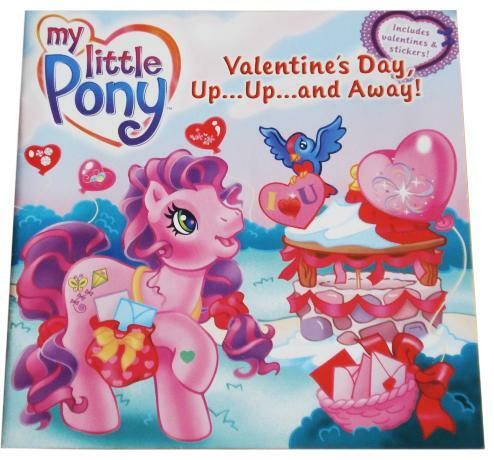 In Valentine's Day, Up...Up...and Away!, ponies are busy preparing valentines to share with all their friends. Each pony has a basket with a heart-shaped balloon attached to it (a great idea for original mailboxes this year!). When one pony accidentally causes a basket to fly away, children learn that accidents happen and there is always a way to fix things, especially if friends work together! Hearing the adorable Valentine's Day wishes the ponies express will surely inspire children to create unique cards of their own. This book reminds children that friendship is the best gift of all. Celebrate it on Valentine's Day! Title: Valentine's Day, Up...Up...and Away!